“A friend is one of the nicest things you can have, and one of the best things you can be” (Anon)! I am a self-taught artist who has enjoyed dabbling and daubing since childhood. I took up ‘serious’ painting in 1985 and dared to start entering my work in shows. I am now totally hooked! If I don’t do something ‘arty’ at least a couple of days a week I get snappy!! My work is influenced by a love of the environment and country life. I am attracted to subjects in the first instance by the way light interacts with the surroundings and I am challenged to capture atmosphere in my landscape work. It is the main thing I examine when choosing a subject. I also attempt to interpret subjects differently by looking at them from unusual angles. My subjects are varied and unrestricted ranging from animals, landscapes, figurative, portraiture, life drawing and still life. Much of my earlier work was executed in oils. I also occasionally use watercolour and enjoy working with pencil and charcoal. However, pastel has emerged as my favourite medium. I enjoy the versatility, vibrancy and immediacy of pastel and the effects which can be achieved by blending the colours together and by ‘scumbling’ one colour over another. No drying time and no clean-up of equipment is an added bonus! I also enjoy the level of control which is possible with this medium. I take commissions and my work is held in numerous corporate and private collections both in Australia and overseas (America, Canada, Switzerland, U.K., Ireland, Yugoslavia, Germany, Poland and New Zealand). I have received awards for work in pastel, oil, charcoal, pencil and watercolour covering categories of still life, portraiture, landscape and drawing. I feel that my strength lies in my drawing skills. I have been involved in several exhibitions – during 1990 with Sandra Wilson and Liz Mazurek at Seymour, and in 1992 (‘3 Dimensions’ at the Old Court House Gallery, Seymour) with Sandra Wilson and Nell Frysteen. During 2002 I was involved in ‘Trawool Connections’ with 6 other artists. 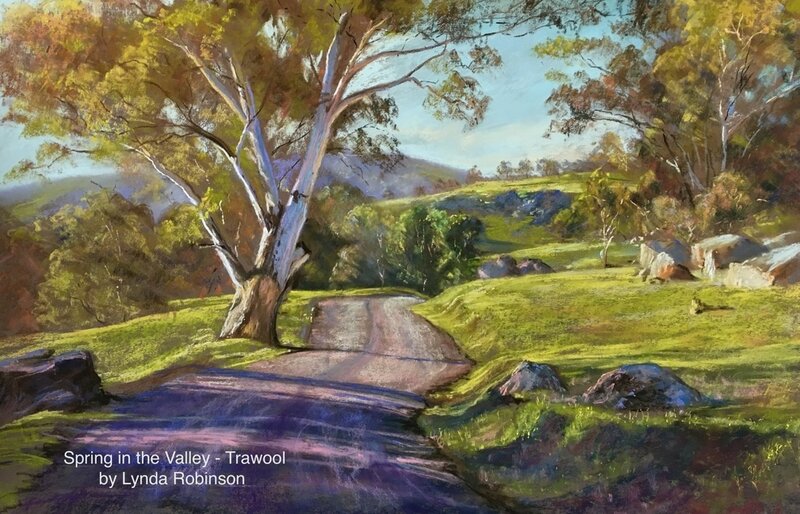 I regularly exhibit at the Old Courthouse Gallery, Seymour, and have also exhibited at Vinegrove Gallery, Euroa, Schoolhouse Gallery, Trawool, ‘The House’ Gallery, Rushworth, ‘Tin Shed Arts’ at Malmsbury, and with the Australian Guild of Realist Artists in Camberwell. My work hangs in numerous public spaces in the Seymour area. I was honoured to be made a Life Member of Seymour & District Art Society in 2002, and to be named ‘Artist of the Year’ in 2003 and 2007. In April 2005 I held a solo exhibition at Heathcote Winery – ‘My Easel and Eye’ – during which 50% of my work was sold and I received 12 commissions. In July 2006 I held a joint exhibition at Heathcote, ‘Beating Around the Bush’, with Liz Mansfield. 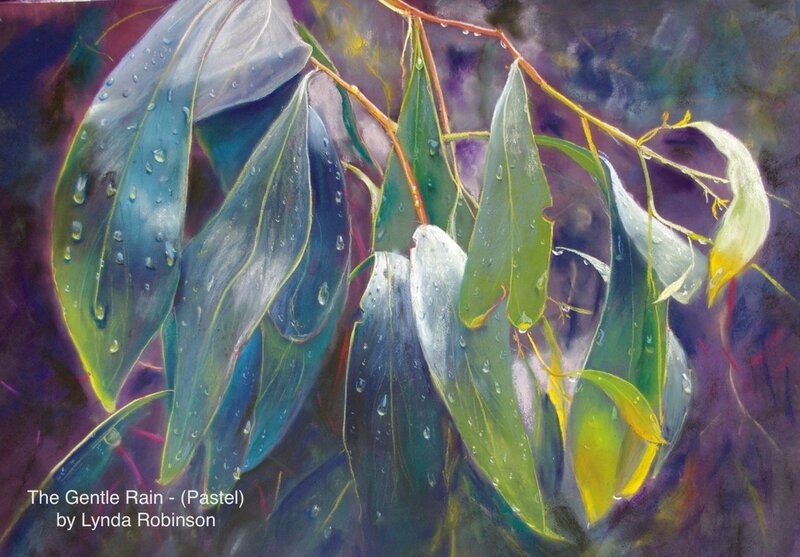 I am also a member of the Australian Guild of Realist Artists. My work can be viewed via the internet at the RedBubble Community Art Site and Paintings I Love art site.